Claire Sharp, a faculty advisor to the Pet Loss Support Hotline at Cummings School of Veterinary Medicine, responds to a reader’s question about what to say to someone who has lost a beloved pet. Q: My mother’s elderly cat recently passed away. The cat had kidney problems for a while, so it was not unexpected. But my mom is devastated. How do I console her? Again, there are no magic words. Some helpful phrases might include: “I am sorry you are feeling sad. I know how hard it is to lose a pet. I know how special Fluffy was to you.” These demonstrate that you recognize her feelings and that her grief is normal. 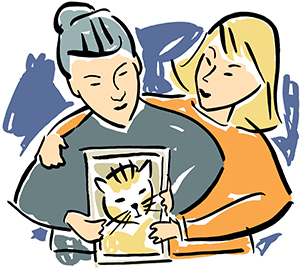 Tufts’ Pet Loss Support Hotline (508.839.7966) also can provide some guidance. First- and second-year veterinary students, trained by a licensed psychologist, are available Monday through Friday from 6 to 9 p.m.